Now that they've bought Digital, Compaq is one of the largest computer manufacturers, rivaling even IBM. (Even though their products are notoriously incompatible with many PC standards, especially regarding video cards.) Where did they get their start? 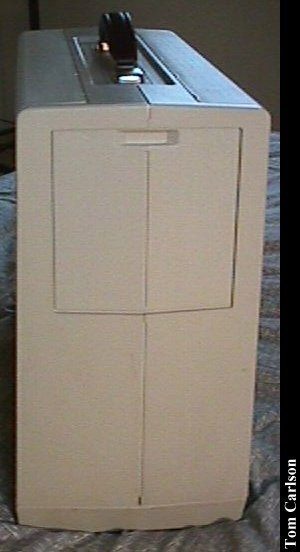 Producing solid luggables like this one. It's your standard XT clone. It has a nice large, clear amber screen. The ports and power hook-ups hide behind sliding panels on the sides. 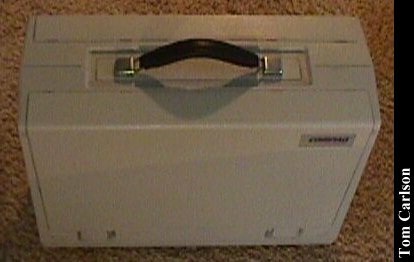 One of the nicer luggable designs, on par with the TRS-80 Model 4P. 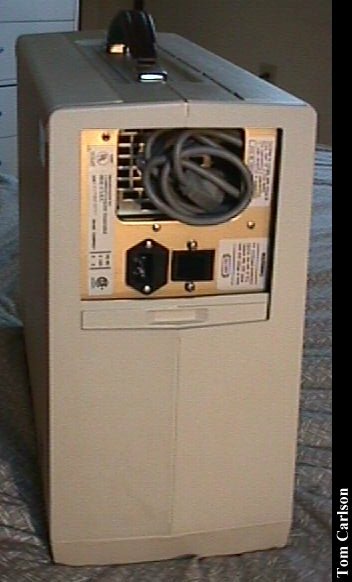 The 'sewing machine' was the very first Compaq computer.When this machine came out, there were no clones. An IBM compatible had the three magic letters on the case. Period. Part of the reason was that IBM had published the source code for their BIOS so that they could claim that anyone who brought out their own BIOS had infringed on IBM's copyrights and would have to stop. 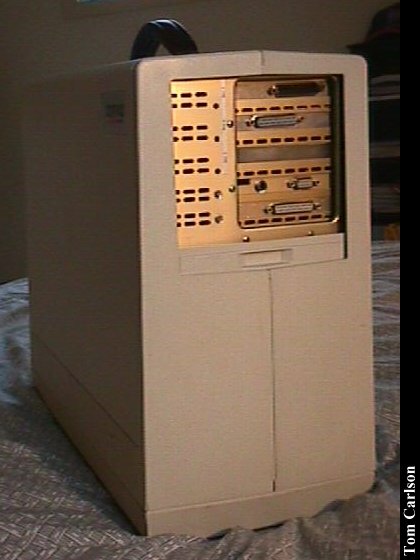 Since IBM's Acorn (the code name for the PC) team had sourced off-the-shelf parts for the PC to keep costs down and time-to-production to a minimum, theoretically anybody else could duplicate IBM's hardware and bring out their own pc. Except for the BIOS problem, without which you could not be guaranteed 100% compatibility. Just try to tell a hacker that he can't possibly do something. IBM should have know better. The guys from Phoenix used two sets of programmers -- one who had access to IBM's source code and another who could be proven in court to be source code virgins. The first group made a list of everything the BIOS did for a specific set of inputs, but carefully avoided any mention of the original code. The second group then took all those notes and wrote their own BIOS that performed exactly the same as IBM's, but completely from scratch without any possible contamination from IBM. They then offered their BIOS up for sale, and Compaq was the first company to bring out a 100% compatible IBM clone. 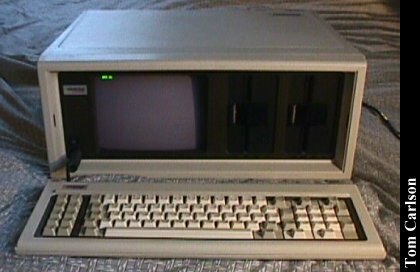 The 'luggable', as it was sometimes called, was the first IBM clone that could run 100% of the software that you could run on an IBM-branded pc. It was the beginning of the end of IBM's hardware monopoly and the start of a multi-billion dollar industry. Standing on end. Looks heavy. But it does have a nice padded handle. It also came with a nice soft-sided carrying case. Port and power plug access are through panels on either side. This shot shows one of them in the closed position. To open the panel, you press in at the bottom and it slides down inside the case. Pretty cool! This panel lets you plug it in. The power cord stores in here as well. This panel allows access to the various standard ports. Close-up of ports through the open panel. Click here to view all comments for the Compaq Portable and to leave your own. 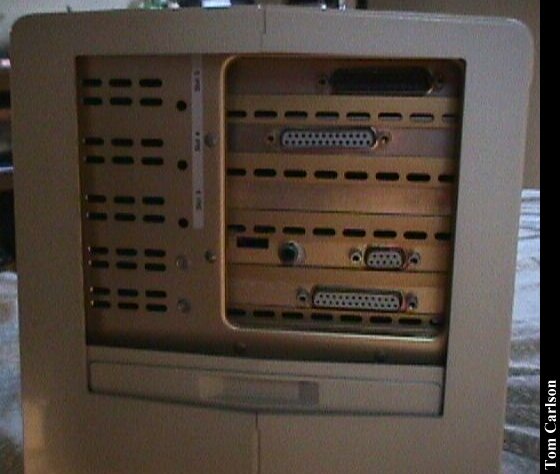 Click here to view comments about other Compaq computers.